COEUR D'ALENE, ID - Drought conditions coupled with extreme fire danger levels continue to persist in northern Idaho. 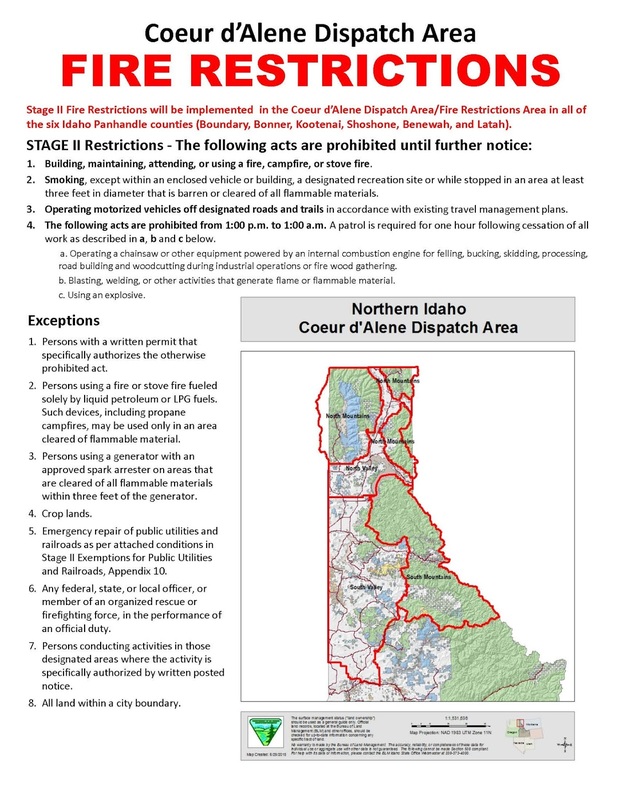 These conditions have prompted fire restrictions to be raised to Stage 2 in accordance with the criteria established in the 2017 Idaho Fire Restrictions Plan for all lands in the Coeur d'Alene Dispatch area. Stage 2 Fire Restrictions will be implemented beginning at 12:01 a.m. on August 16, 2017, and will remain in effect until further notice. 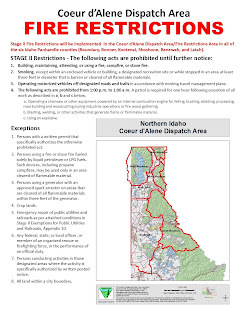 Stage 2 Fire Restrictions are being implemented in the Coeur d'Alene Fire Restriction Area, which includes all state, federal, and private forestland and rangeland in Benewah, Bonner, Boundary, Kootenai, Shoshone, and Latah Counties. This also includes public lands in Washington and Montana that are administered by the Idaho Panhandle National Forests. These restrictions are being implemented by agencies managing lands or providing wildland fire protection in the area, including the Bureau of Land Management (BLM), the Coeur d'Alene Tribe, Kootenai Tribe ofldaho, Idaho Department of Lands (IDL), the U.S. Forest Service (USPS), and the U.S. Fish and Wildlife Service (FWS). 2. Smoking, except within an enclosed vehicle or building, a designated recreation site or while stopped in an area at least three feet in diameter that is barren or cleared of all flammable materials. a. Operating a chainsaw or other equipment powered by an internal combustion engine for felling, bucking, skidding, processing, road building and woodcutting or any other activity employing the use of an internal combustion engine or off-road activity associated with industrial operations or fire wood gathering. 2. Persons using a fire or stove fire fueled solely by liquid petroleum or LPG fuels: Such devices, including propane campfires, may be used only in an area cleared of flammable material. 3. Persons using a generator with an approved spark arrester on areas that are cleared of all flammable materials within three feet of the generator. 4. Private landowners using charcoal (disposed of properly) or propane barbecues on their own lands. 5. Normal operations on crop lands. 6. Emergency repair of public utilities and railroads as per conditions in Stage II Exemptions for Public Utilities and Railroads. Please see Appendix 10 of the 2017 Idaho Interagency Fire Restrictions plan available at htt p:// www.idahofireinfo.com/ . 7. Any federal, state, or local officer, or member of an organized rescue or firefighting force, in the performance of an official duty. 8. Persons conducting activities in those designated areas where the activity is specifically authorized by written posted notice. 9. All land within a city boundary. With the extreme conditions the region is experiencing, fire managers are asking the public to be extra cautious when spending time in the outdoors. 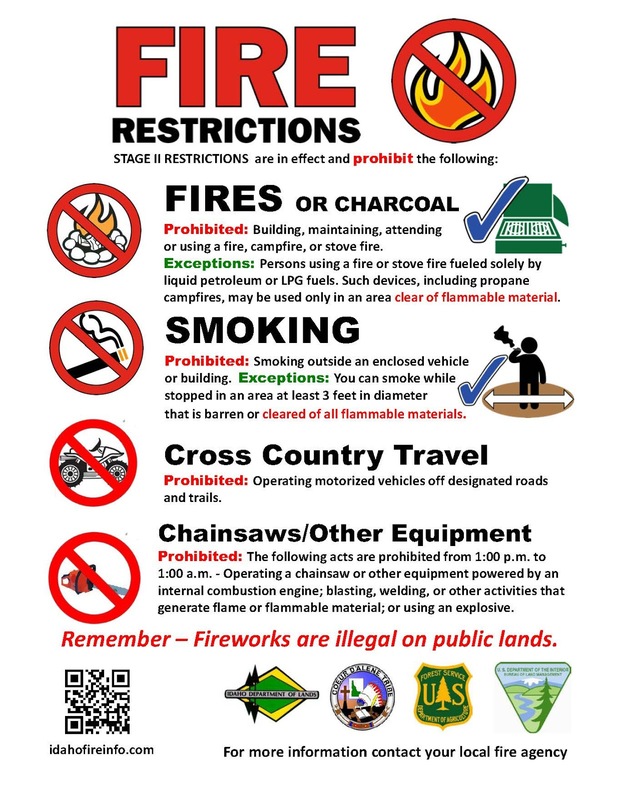 As a reminder, fireworks are prohibited on state and private forestland and rangeland, and on public lands, roads, and trails in Idaho during closed fire season (May 10 through October 20). 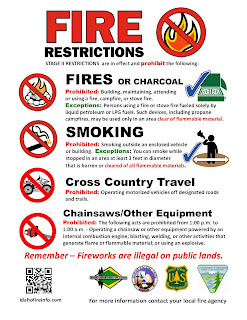 Possession and/or use of fireworks is always prohibited on federal public lands. Please visit http://www.idahofireinfo.com/p/fire-restricti n .htmJ for a detailed map and current information regarding fire restrictions or contact the local land management office.